GPG is the abbreviation for Grind – Plate – Grind. 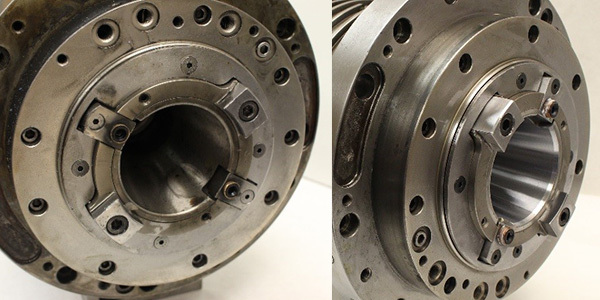 This is our process for surface restoration and it is used to restore out of tolerance critical surfaces like bearing journals to original specification. 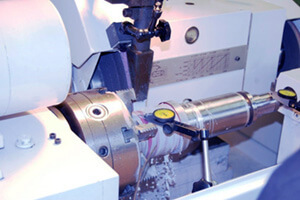 This process is also used for restoring tool interface surfaces like CAT or HSK tapers. Our experience shows that about 35% of all spindles require some form of surface restoration. For modern machine centers to achieve their incredible accuracy it is essential that all critical surfaces are within specification. These surfaces include bearing journals and tool interface surfaces. These surfaces typically have tolerances measured in microns. (0.000039”). Finish Grind on a shaft bearing journal with our Kellenberger universal grinder. Our GPG process allows us to restore worn and damaged surfaces to original OEM specifications. The first step is a rough grind also called a “green” grind. Most worn surfaces are irregular. This first grind will make the surface uniformly out of tolerance. Shaft O.D.s are ground too small and housing bores are ground too large. This is the first “G” in GPG. After the metal deposition is complete the surfaces are precision ground to micron tolerances and exact ISO fit. This is the second “G” in GPG. GPG is a rather expensive process and can significantly affect the price of the repair. Even though we will measure a shaft in microns, a visible inspection of the tool interface can usually tell if it will require GPG. However, careful climate controlled inspection is required to make a proper assessment of the bearing journals. For these reasons we cannot guaranty our sight unseen estimates until we complete our no-obligation evaluation. We do all of our grinding in-house with our Kellenberger Universal grinder, considered to be one of the finest in the industry. We can hold one (1) micron tolerance. By keeping our grinding in house we can control the quality of our repairs, realize faster repair time and save our customer money.